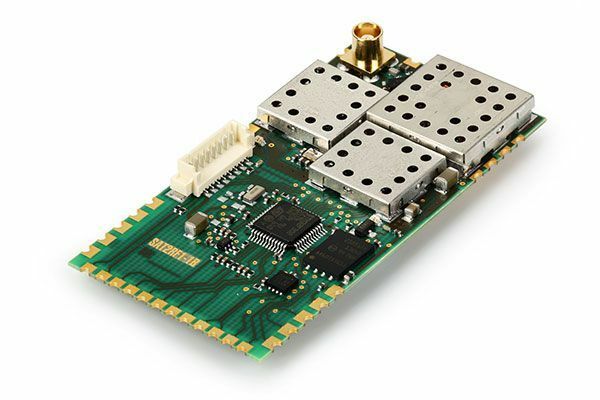 NanoAvionics UHF Digital Radio SatCOM UHF utilizes a half-duplex architecture with high-performance low power consumption transceiver, which is controlled by a dedicated Cortex – M4 MCU. It uses the ultra-high frequency band (UHF) that is programmable in 430 to 440 MHz range. The receiver has an excellent sensitivity of -120 dBm at 9600 baud rate and the transmitter supports high throughput data communication in narrowband channels with GFSK, FSK (including G3RUH), MSK and OOK modulations. A bandpass filter can be selected depending on customer specific frequency (e.g. 435-438 MHz for the radio amateur satellite frequency band). Transceiver can operate in transparent mode for customer specific protocol support or in AX.25 packet mode. When used with NanoAvionics SatBus 2CX flight computer, 2 UART and 4 I/O pins of the radio are used to control the upload of the firmware for ADCS and OBC subsystems in orbit.